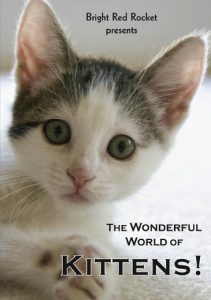 The Wonderful World of Kittens brings you into to a special world inhabited by kittens galore. You’ll see kittens frolicking, jumping, cuddling, eating, drinking, climbing, purring, meowing, playing ball, chasing, sleeping… all while looking absolutely adorable! With a fun musical score by the talented musician, Brian Dewan, this is just pure entertainment for cat lovers of all ages. You can enjoy the fun and frolic of kittens with no litter boxes to clean, no cat hair to vacuum and no scratches on the furniture. Just plain old kitten entertainment for your viewing pleasure. The Wonderful World of Kittens is also perfect for your veterinarian’s office or school. If you purchase the correct license for your institution, you’ll also get the special looped version perfect for playing all day. The Individual License is for individuals purchasing the disc who will show it privately. The Limited Performance License is for veterinarian’s offices, hospitals, and other institutions that will show the disc to limited groups of people. The Public Performance License is for libraries, K-12 schools, clubs, and other institutions that will show the disc to the public at large. Would you like to see pictures of our Kitten Superstars? Of course you would.